Understanding the importance of estuarine and coastal areas for the migration of fish and recovery of populations requires tracking a fish’s movement. For this purpose, Pieterjan Verhelst analyses the tracks of tagged Atlantic cod (Gadus morhua) and European eel (Anguilla anguilla), detected on the fish acoustic receiver network of the Belgian LifeWatch Observatory. 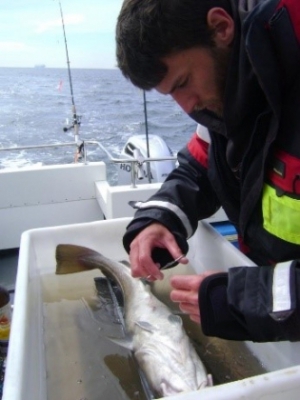 As a PhD student at Ghent University, Pieterjan Verhelst studies eel (Anguilla anguilla) and cod (Gadus morhua) migration in marine, coastal and estuarine systems in collaboration with the Research Institute for Nature and Forest (INBO) and the Flanders Marine Institute (VLIZ). His research contributes both to the fundamental knowledge of these fish species’ movement and habitat use, as well as to the understanding of their conservation needs. Estuaries and coastal areas are subject to anthropogenic activities, as the largest harbours and economic activities are located along river banks and close to shore. Known to have a high habitat diversity, estuaries and coastal areas play a key role in the life cycle of many organisms, including diadromous and marine fish. As such, these areas can serve as transport routes, foraging or nursery areas. In order to conserve these areas in a cost-efficient and sustainable way, a better understanding of the ecosystem functions and services is needed. The Scheldt Estuary and adjacent coastal area of Belgium are an important migration route and resident area for diadromous and marine fish. Atlantic cod (Gadus morhua) and European eel (Anguilla anguilla) were chosen as economic important indicator species for marine and diadromous fish species, respectively. In order to assess the importance of estuarine and coastal areas as a key habitat for these species, the fish acoustic receiver network of the Belgian LifeWatch Observatory provides the necessary long-term monitoring and broad spatial coverage. The results of this study will be useful for management measures for the conservation and restoration of the eel and cod stocks. After catching fish with rod and line or fyke nets, a transmitter is surgically implanted in the abdominal cavity of an individual cod or eel. 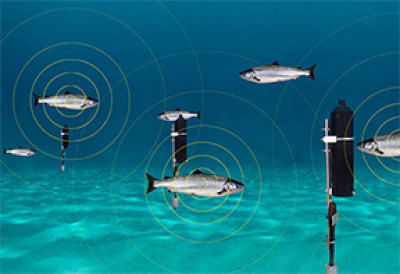 When a fish swims in the vicinity of an acoustic receiver, the unique ID-code of the transmitter is stored on the receiver together with an exact timing of the detection. The permanent large scale network of acoustic receivers of the Belgian LifeWatch observatory allows trajectory reconstruction of tagged fish in riverine, estuarine and coastal areas in Belgium such as the Belgian Part of the North Sea (BPNS) and Scheldt Estuary. At least once every six months, the data stored on the receivers is recovered. These acoustic data require sophisticated analysis to unravel the extensive information they contain. Analysing these spatiotemporal patterns includes investigating how receiver locations are interlinked, at what conditions the detection patterns occur and how fish movements and distribution are influenced by environmental factors. The enormous numbers of detections, the high autocorrelation and zero-inflation call for advanced modelling approaches, such as network analysis and generalized linear mixed modelling, and a performant big data analysis environment. Covering riverine, estuarine and coastal areas in Belgium, the BPNS and Scheldt Estuary, the permanent fish acoustic receiver network of the Belgian LifeWatch Observatory, allows the long-term monitoring of various aquatic species. Acoustic receivers are installed on shipping buoys, ship wrecks, artificial reefs and bottom moorings. Different Vemco receiver and tag types are deployed to monitor different species in varying habitats. Data of the sensor network are stored in the European Tracking Network (ETN) data portal and can be explored in the Data explorer. Both online web applications were developed in the framework of LifeWatch. ETN facilitates the storage, access and sharing of aquatic telemetry data. Excitingly, Pieterjan discovered that European eel migrate through the English Channel, based on eel detections tagged in The Netherlands and Germany. Verhelst, P.; De Meyer, J.; Reubens, J.; Coeck, J.; Goethals, P.; Moens, T.; Mouton, A.M. (2018). Unimodal head-width distribution of the European eel (Anguilla anguilla L.) from the Zeeschelde does not support disruptive selection. PeerJ 6: e5773. Verhelst, P.; Bruneel, S.; Reubens, J.; Coeck, J.; Goethals, P.; Oldoni, D.; Moens, T.; Mouton, A. (2018). Selective tidal stream transport in silver European eel (Anguilla anguilla L.) – Migration behaviour in a dynamic estuary. Est., Coast. and Shelf Sci. 213: 260-268. Verhelst P.; Baeyens R.; Reubens J.; Benitez J.; Coeck J.; Goethals P.; Ovidio M.; Vergeynst J.; Moens T.; Mouton A.. (2018). European silver eel (Anguilla anguilla L.) migration behaviour in a highly regulated shipping canal. Fish. Res. 206: 176 - 184. Verhelst, P.; Reubens, J.; Pauwels, I.; Buysse, D.; Aelterman, B.; Van Hoey, S.; Goethals, P.; Moens, T.; Coeck, J.; Mouton, A. (2018). Movement behaviour of large female yellow European eel (Anguilla anguilla L.) in a freshwater polder area. Ecol. Freshw. Fish. 27(1): 471-480. Verhelst, P.; Buysse, D.; Reubens, J.; Pauwels, I.; Aelterman, B.; Van Hoey, S.; Goethals, P.; Moens, T. (2018). Downstream migration of European eel (Anguilla anguilla L.) in an anthropogenically regulated freshwater system: Implications for management. Fish. Res. 199: 252-262. Verhelst, P.; Boets, P.; Van Thuyne, G.; Verreycken, H.; Goethals, P.L.M. ; Mouton, A. (2016). The distribution of an invasive fish species is highly affected by the presence of native fish species: evidence based on species distribution modelling. Biological Invasions 18(2): 427-444. Reubens, J.; Verhelst, P.; van der Knaap, I; Deneudt, K.; Moens, T.; Hernandez, F. (2018). Environmental factors influence the detection probability in acoustic telemetry in a marine environment: results from a new setup. Hydrobiologia Online: 1–14. Bruneel, S.; Gobeyn, S.; Verhelst, P.; Reubens, J.; Moens, T.; Goethals, P. (2018). Implications of movement for species distribution models - rethinking environmental data tools. Sci. Total Environ. 628-629: 893-905. Breine, J.; Pauwels, I.; Verhelst, P.; Vandamme, L.; Baeyens, R.; Reubens, J.; Coeck, J. (2017). Successful external acoustic tagging of twaite shad Alosa fallax (Lacépède 1803). Fish. Res. 191: 36-40. Huisman, J.; Verhelst, P.; Deneudt, K.; Goethals, P.L.M. ; Moens, T.; Nagelkerke, L.A.J. ; Nolting, C.; Reubens, J.; Schollema, P.P. ; Winter, H.V. ; Mouton, A. (2016). Heading south or north: novel insights on European silver eel Anguilla anguilla migration in the North Sea. Mar. Ecol. Prog. Ser. 554: 257-262. Some of Pieterjan’s R scripts are available on his Github page. As the laureate of the 2016 VLIZ Communication Award, Pieterjan could benefit from a personal communication coaching by the VLIZ Communication division. This collaboration resulted in an educational video on eel migrations and acoustic telemetry. Paaiproces van de paling is nog altijd door niemand waargenomen: hoe doen ze het toch? Does rain trigger the migration of silver eels? Radio interview with Pieterjan Your browser does not support the audio element. Tel. : +32 499 38 72 87Find Pieterjan on IMIS and ResearchGate. Pieterjan Verhelst holds a doctoral grant from the Flemish Agency for Innovation & Entrepreneurship (VLAIO), now under the auspices of the National Science Fund FWO and is affiliated with Ghent University (Marbiol). Pieterjan works in close collaboration with the Research Institute for Nature and Forest (INBO) and the Flanders Marine Institute (VLIZ). Fish acoustic receiver network: Learn about the fish telemetry network of the Belgian LifeWatch Observatory. ETN: Access, store and share fish tracking data on the European Tracking Network data platform. Data explorer: Access and explore the acoustic fish detection data with the LifeWatch data explorer. LifeWatch GitHub: Find the scripts and tutorials developed for the use of data of the LifeWatch Infrastructure.